Although large wooden waterwheels of various types and designs have been used for many centuries, they are not generally suitable for generating electricity as part of a small hydro power system. The main reason for this is that they are large, heavy, rotate at low speeds and would require complex gearing or pulleys to enable the drive shaft to reach speeds high enough to run an electrical generator. Water turbines on the other hand are capable at rotating at much higher speeds, are much lighter, smaller, easier to fabricate and more compact than the traditional wooden waterwheel. Although based on the same principals as a classic water wheel, water turbines are far more suited for small hydro electricity generation as they are far more efficient in terms of water usage over a wider range of head and flow values. • Impulse Turbines – Impulse turbines operate in free air and convert the kinetic energy of one or more pressurised jets of water into mechanical energy. • Reaction Turbines – Reaction turbines operate fully submerged in water and convert the potential energy of the pressurized water into mechanical energy. While there are many different water turbine designs readily available in the market place, their selection in any given small or micro hydro installation will depend on the head of water, the volume of flow, and power output required. One very common and efficient micro turbine design is the Turgo Turbine and the beauty of the turgo turbine lies in its simplicity. The turgo turbine is an impulse turbine design which uses a special nozzle at the end of a pipe to convert the flow of the water into a high pressure jet. This jet of water is then directed at an angle of about 20 degrees towards the turbines internal water wheel which uses spoon-shaped blades to capture the jet of water. These blades are specially shaped so that the pressurised water enters the blades on one side and then drops away and exits on the other converting the kinetic energy of the water jet into rotational shaft power. This tangential flow of the water across the turbines runner means that the waste water leaves the blades without interfering with the incoming water jet as is the case with other impulse turbines. The result is that a Turgo turbine can have a smaller diameter runner and blades producing a highly efficient impulse turbine for an equivalent power input allowing it to rotate at much higher speeds to drive an electrical generator. One of the disadvantage of turgo turbine designs is that to generate sufficient nozzle pressure to rotate the turbine runner at high speeds, they require more head height than other designs and have to be connected to a penstock or pipe to channel the water, in order for it to function. However to overcome these limitations, instead of using just one nozzle and water jet to rotate the turbines runner, the turgo turbine can be fitted with multiple nozzles located equally around its circumference. Then a turgo turbine can be equipped with either two, four or six jet nozzles placed around the turbines runner and blades extracting more kinetic energy from the water before too much water splash interference occurs reducing its efficiency. This increase in the number of water jet nozzles means that the Turgo Turbine can operate under low-head and low-flow conditions. The amount of energy extracted from the water will increase as the power output is proportional to the number of nozzles. Then multi nozzle impulse turbines are ideal for use in stand alone micro hydro DC power systems designed to charge a battery bank or power a home. 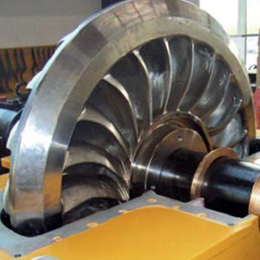 Turgo turbine designs represent an improvement in the available shaft power compared to conventional water wheels and other impulse turbine designs. They are generally less expensive to make and with multiple nozzles can handle a greater flow of water, so a smaller turgo turbine can generate the same amount of power as a larger water wheel. For more information about Turgo Turbines and how to generate your own electricity using the power of water, or to obtain more hydro energy information about the various impulse turbine designs available, or to explore the advantages and disadvantages of using hydro energy, then Click Here to order your copy from Amazon today about how to build a water turbine generator and other types of Hydro Turbine Designs. Sir ,we would like to drive a hydraulic pump with turgo wheel say 200mm dia what is the max velocity ,we have a water velocity of 350m/sec can we use that.!! this is excellent tutorial. It is very useful for beginner to learn about turbines and hydro.